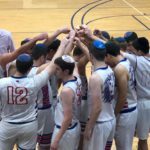 On Wednesday night, the MTA Varsity Basketball Lions took on Hillel in the Max. MTA started out with an early 10-0 lead. Hillel caught up, but MTA was still in the lead 12-10 at the end of the first quarter and 14-12 at halftime. Hillel took the lead mid-way through the third quarter 34-33. Led by Eitan Warburg (’19) with 21 points (4-6 from 3, 7-7 FT) and Eitan Pfeiffer (’19) with 15 points, MTA did not let up. Due to its great team defense, holding Hillel to 38 points, MTA emerged the victor, 45-38, for its first win of the regular season.